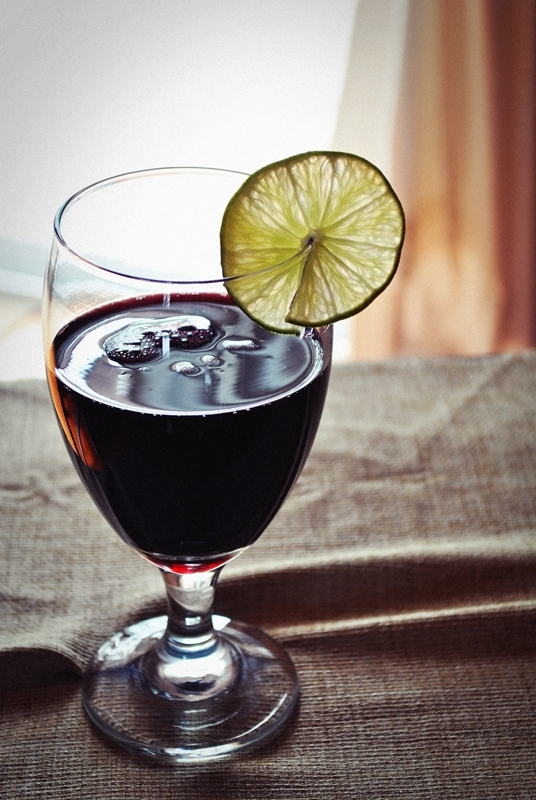 Go to any Peruvian’s home and you will almost always be offered a glass of this: chicha morada, a chilled beverage made from purple corn and infused with pineapple and cinnamon. It’s a thirst-quenching drink, sweetened slightly with cane sugar and then brought to life with fresh lime juice. I’ve been drinking this since I was a tater tot. The flavor is really like none other. I keep taking sips to really explain…but the first I notice (and love) is the wonderful floral and fruity aroma that whacks you in the nose when you tip the glass for a drink. It’s almost like you walked into a groovy cool place with lots of delicious and pretty things. And the taste: smooth and supple with subtle notes of berry and spice, and beautiful– like a song you never knew you loved. I’m pretty sure I saw that on a wine bottle somewhere. Speaking of notes + songs, I’m going to be supplementing my posts with music pertaining to mood and food since I think they both sort of go hand-in-hand. Plus, it’s something that’s always been in my blood. Where there’s Peruvians, there’s music and food. Seems like a natural fit here. Oh! And remind me sometime to show you a video of me dancing when I was 9. Good stuff. I can’t tell you how many times I’ve heard this song playing at our family parties; it’s a classic. It reminds me of summer time, cold beer, and ceviche. 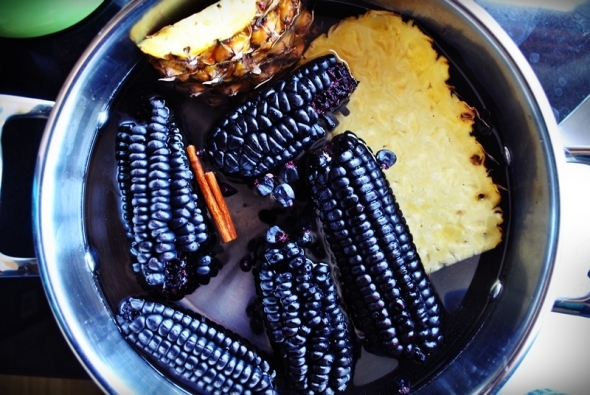 Toss the purple corn, cinnamon sticks, and pineapple rind into a large stock pot. Pour the water over the top, put a lid on and turn the heat to high. Let it come to a boil and then turn the heat down to medium, allowing the water to boil gently, with the lid on, for an hour. After an hour, take off the lid and let it continue to boil gently to reduce a bit for another 30 minutes. At this point, the liquid should be very dark and almost opaque– a gorgeous shade of wine. Take it off the heat and let it cool to room temperature, several hours. When it’s cool, strain it in a colander. Throw away the purple corn, cinnamon sticks, and pineapple rinds. To the chicha, stir in the sugar and lime juice. Taste it for sweetness, adding more sugar and lime juice for your palate. I strain it again to get rid of any lime “pulp” but you don’t have to. Stash this in the fridge for many hours until very chilled. For best results, don’t add ice to this as it’ll mess with the flavor. Optional: before serving you can add pieces of fresh pineapple in each glass too. My in-laws live in Florida and whenever we visit them I’m always surprised by the amount of Peruvian restaurants in the area. Funnily enough, we’ve never tried any of them! 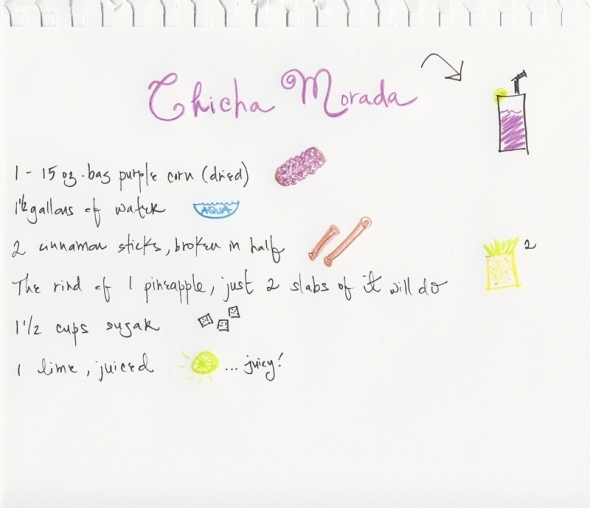 Chicha morada is so good and refreshing– it’s such a comfort for me because it reminds me of Peru! Ivette - Living in south Florida there are plenty of Peruvian restaurants around. I tried this at “La Perla” a restaurant nearby a few months ago and it was AMAZING!!!!! Looks like wine, and tastes like heaven!! Stephanie - Hey Masha! I’ve always simmered the juice with the pineapple rind for the whole time but I’m sure you can experiment to see if it would be good w/o cooking for so long. You can subscribe to my blog through the RSS feed link at the top of the page. Thanks for stopping by! Masha @ RecipeStudio - This is wild! Probably the strangest drink recipe I’ve ever heard (but then again, I grew up drinking home-grown kombucha before it was popular). Do you think it’s necessary to boil the pineapple for so long? Does the taste come from the rind or the pulp? I would guess you could just add fresh chopped pineapple at the end and let it release its juice as the liquid cools. Thank you for posting. Btw, how can I subscribe to your blog? Stephanie - Theresa, it may be difficult to find unless you have a very well-stocked Latin American store near you. Otherwise, buy it online. I’ve put the link on the post! Stephanie - Katie, well you’re very welcome! This is definitely a unique drink and you really won’t find it anywhere unless it’s at a Peruvian restaurant or someone’s home. Delicious! Stephanie - Linda, thank you so much! If you’re able to get your hands on some purple corn I think you’d really like it. Definitely interesting and delicious! Katie - Cool! I’ve never heard of this before but it sounds really interesting. I love learning about new foods, especially when they’re culturally specific. Thanks for sharing! LP @dishclips - That purple corn looks absolutely beautiful. It looks like an interesting drink. Thanks for sharing! Stephanie - Laura, I’ll have to investigate that beer you mentioned. I don’t think I’ve had that! Laura - I’ve had a beer-like form of chicha. You chew the corn before boiling to get the enzymes going? I thought it was kind of odd, but was a wonderful beverage. But, this – so gorgeous, light and refreshing. Might have to give it a try if I can get my hands on some purple corn! Renee @ Tortillas and Honey - This is such an interesting and lovely recipe. I looks really beautiful and refreshing, I think I’m going to have to try it! Thanks for the suggestion of where to purchase the purple corn, it really helps! Have a great day!